Do you believe in telepathy magic exist? In a performance, the Magic Jack, two brothers as we performed a poker telepathy. First of all, the first play old Jack, come up with a deck of cards, any look at the scene of a viewer, let him out five cards, old Jack eyes quickly scanned about five cards, namely, 4 of hearts, plum 6 side pieces A, spades 5 and 9 square pieces, and then select side piece 9 to the audience, the audience will turn over cards that he will be remaining four cards face up one by one placed to the desktop, and just All this happened, stood a small distance can not look at Jack completely. , The old Jack the audience said, "I give you what this card is only you and I know, but me and my little brother Jack in the psychological sense there is a mysterious force, he can guess What are this card, and asked the following small Jack came. " Jack went to a small table playing cards stood before, his hands folded into his chest and thought a few seconds, quickly out of the old Jack to the audience's card is 9 square pieces. The magic in the United States since the eighties pop, a lot of viewers watching the old magic after the first reaction is between Jack and Little Jack must have taken place in some kind of exchange of information, such as gestures, body language, but also said that with one or two movements out the color and size of a card is not easy. In fact, this magic is a purely mathematical game, originally developed by a mathematics Ph.D. Massachusetts Institute of Technology invented. In order to increase the Magic's interesting, some of the magician the magic, the two partners live performances and even the two cities are in two countries, by telephone, e-mail notification own speculation, but no matter how to change the way performance, One thing is constant, small Jack must know or see the five cards in the remaining four cards. Since the magic of the mystery in the four cards on this, then how old Jack is told by the four licensed small-Jack and the fifth card of the suit the size of it? Some people may think of permutations and combinations, four different cards, a total of 4 * 3 * 2 * 1 = 24 arrangement, it is because of this? 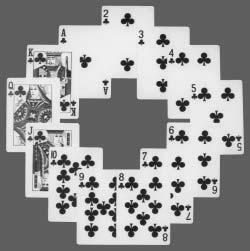 But a deck of cards (remove the size of the King 52), remove four, the remaining 40 sheets, 24 said the arrangement can not be more than 40 kinds of possibilities, but each time the five cards, it is also possible The same figure, the same color, two brothers in the end the audience will not know in advance which of five cards out, and then want to go, really a headache. In fact, the magic is not a simple permutation and combination, to go through several steps, first by the old Jack. We all know that poker only four colors, and if out of five cards, of which at least two cards is a suit, (the equivalent of four to five apples into a box, at least there will be a box two or more of the apple), above 5 cards the Chinese film A and the side piece 9 on the part of a suit, old Jack is not a license to any given audience, and must have two identical cards in a suit, then he The remaining four cards on the table, we must ensure that the first card (side pieces A) and the audience in the hands of the card (side pieces 9) is a flower, to see such a small square piece Jack A, one can infer The suit goes on is out of square pieces license. Some people would say, and to guess if always the same suit cards on the first position the license, will be aware, in fact, the two brothers can be good on the first of several pre-agreed location, not necessarily the first . After that the colors, the old Jack is how to use Hearts 4 Spades 5 and 6, told a small plum Jack goes on the license number is 9 then? The remaining three cards that may have been 6, but also may have been plum, but one thing is certain, from this same deputy poker three cards is a separate, magic inventor's wisdom lies. Old Jack and Little Jack first to compare any two cards to develop a big who who is small, "rules", for example, poker 52 cards in the hearts of the cards the most, followed by spades in the card, then plum blossom, square film, the same suits of cards, K maximum, A Min. Thus, any three cards in, there will be a "big", a "middle card" and a "small card." In placing the three cards, there are large, medium, size medium and small sized, small Zhongshan University, in size, small and medium display large order of six, the above figure is clearly the "medium and small" approach. This arrangement could represent the six 1,2,3,4,5,6 six figures, but the cards from A to K, a total of 13 numbers, six numbers in any case that can not be 13 numbers ah ! A lot of smart thinking in his audience the principles of this magic, perhaps you can guess all the secrets before, but the last step confused them stumped, and this is precisely the magic of finishing touch the pen. The first step in magic, and the hidden cards of a suit the cards are used to indicate the same color, but its role really has not finished. Jack took out the old square piece 9 to the audience, but did not get side-chip A to the audience, this is a reason. We can in the figure the 13 cards arranged in a ring found in 9 and A, then the number of counter-clockwise from 9 to A, to the number 8; if the number from A to 9, only a few 5. Rest of the "medium and small", said three signs of 5, but that can not be 8, so the old Jack to 9 to the audience, and when Little Jack saw A and 5 of the information, in their minds from A counterclockwise Number 5, 9, under the final answer. In the course of the magic, the old Jack and Little Jack is more like a secret communication to complete, before the start of the show, two of these articles should first formulate the "communication protocols", after a four lit with that old Jack The license for the possession of the cards in the hands of the audience is encrypted, then a small Jack already know the rules of their own to decrypt, "response" to the color and number of licenses goes on. The five cards of magic has been a lot of people as "the most brilliant mathematical magic," so many people to experience the mystery of mathematics in the fun.